Now, don’t misunderstand: This column is not disputing Osaka’s qualifications to play for Japan. She has Japanese and American citizenships, so she is legally Japanese. Further, if she wishes to self-identify as a Japanese, that is her right. JBC has always supported the liberty of individuals to decide their own identities and not suffer the ever-present “identity police” scrutinizing an individual’s “Japaneseness” at every turn. The skinny: Osaka is Japanese. And American. And Haitian (her father’s background). So applause, please, for the power of diversity to produce a world-class athlete and person. May it inspire others to rethink “What is a Japanese?” and be more inclusive. Sadly, it probably won’t. We’ve had many people (including two diverse Japan international beauty queens, Ariana Miyamoto and Priyanka Yoshikawa) who tried but made little impact. One problem is that, unlike them, Osaka is insufficiently self-aware of her situation as a representative of Japan. Yes, living in the U.S. for the past 17 of your 20 years, as a citizen, could make you “American.” And growing up in an extended Haitian household might make you “Haitian” too. But professing a knowledge of “Japanese culture” by dint of having a Japanese mother (who, according to The New York Times, was estranged for about 15 years from her Japanese family for marrying a black man) is a bit, well … dangerous. Bear with me and I’ll explain what I mean. Not to mention expectation. Representing Japan is something done very carefully, due to the intense pressure Japan in particular puts on its international athletes. With hyper-competitive national pride and superiority-inferiority issues coming into play, Japanese society has unreasonable expectations of winning. Just watch Japanese media during international competitions such as the Olympics. If it’s not pundits from networks like NHK blithely asking Japan’s silver medalists why they didn’t get the gold, then it’s Japan’s sports journalists covering their overseas athletes’ every move. Especially their slip-ups. Remember figure skater Midori Ito? On nationwide front pages and TV screens they captured every twist and turn in slow motion as she tumbled onto the ice in 1992. She managed a silver but had to publicly apologize for not getting gold. Then, she retired. At age 22. Or table tennis star Ai Fukuhara? When she didn’t medal in 2004, she also had to apologize on NHK for somehow having “betrayed” (uragitta) her supporters. Or skater Shizuka Arakawa? After years of tribulations, she finally won gold in 2006. Then she summarily retired. At age 24. Possibly because she knew there was nowhere to go but down. But when figure skaters in other societies can still skate and medal into their 30s, Japan’s athletic careers get shortened by the pressure. This pressure can even be fatal. Some years ago in the Mainichi Shimbun, writer Mark Schreiber translated a Flash magazine article (Oct. 31, 2000) recounting how Japan’s medalists from the 1968 and 1972 Olympics (including Masatoshi Nekota, Takeshi Kato, and Horoomi Yamada) had all died younger than age 40 of cancer, strokes and heart failure. Why? Chronic stress and weakened immunities from overexertion. Tokyo 1964 bronze medalist Kokichi Tsuburaya, who missed the following Olympics due to an injury, killed himself at age 27 due to the psychological pressure. As did swimmer Ryoko Urakami and hurdler Ikuko Yoda. Survivor medalist Kenji Kimihara stated that “about 30 or so” of his fellow Olympians had also died before their time. Those are the pressures on garden-variety Japanese. Now consider the extra hurdles for “mixed Japanese” or hāfu. “Race” becomes an issue when they are not winning. In 2011, Japan’s international rugby team finished at the bottom of their pool in the Rugby World Cup. The problem, according to the Japan Rugby Football Union? “Too many foreigners on the team.” It was subsequently purged. Or consider Japan ice dancers Chris and Cathy Reed (siblings with Japanese citizenship through their mother), who still haven’t medaled in an Olympics. Do you think Osaka will be exempt from this line of attack? Let’s call it “Nippon-claiming.” And it’s part of a universal phenomenon found in highly racialized societies called “They’ll claim us if we’re famous.” They’re champions because of their Japanese characteristics. Was Osaka aware of all this when she signed up to represent Japan? Well, according to an Aug. 23 feature in The New York Times, her father decided this for her when she was about 10 years old. The United States Tennis Association had an enormous pool of players to pick from and “showed little interest” in helping her develop. So Osaka joined the Japan team as a bigger fish in a smaller pond. And as her stature rose, in came the lucrative sponsorships. Nissin cup noodles. Wowow TV. Adidas. And now, with her U.S. Open victory, she stands to make even more money from Japan’s top brands than her American colleagues. Well done. But she’s gotta keep winning, or else. Otherwise half-membership in the tribe will work against her. 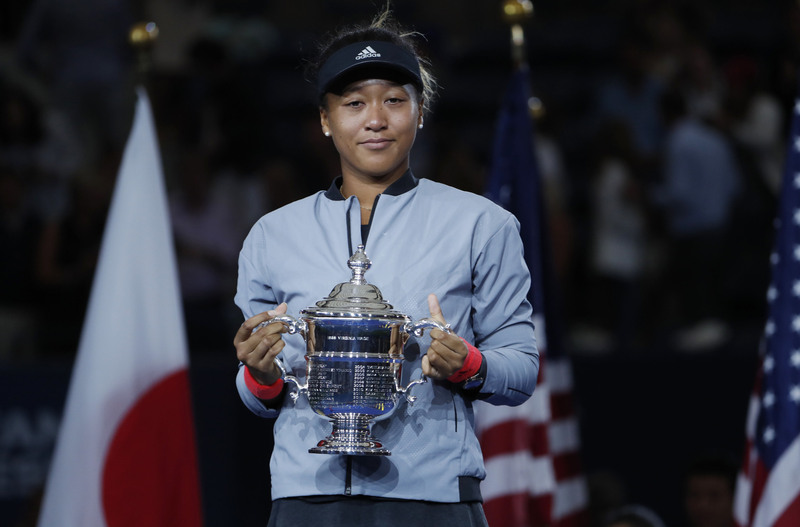 Given the slumps that sportspeople inevitably face, I sense Osaka will soon be dealing more with the pressures of perfectionism in Japanese sports than the game itself. 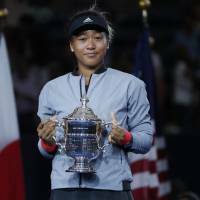 So again, wholehearted congratulations to Japan champion Naomi Osaka. Long may she play, and win. But I have a feeling that swimming in Japan’s smaller but boiling pool of athleticism may shorten her overall career. Heaven forbid it should also shorten her life.